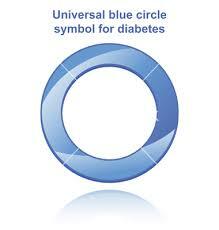 This Saturday, November 14th, is World Diabetes Day (WDD). The day people around the world will mark in various ways to involve the local community, engage the media, and raise awareness of key diabetes issues among decision-makers and the public. In 2008 over 1.2 billion people were reached through campaign messages. One of the most stirring and public displays of WDD will be the 1107 monuments lit in blue around the world, from Sydney to San Francisco, from New York City’s Empire State Building and United Nations building to the Obelisque in Paris. November 14th marks the birthday of Dr. Frederick Banting. Born November 14, 1891, Dr. Banting, along with Dr. Charles Best, discovered life-saving insulin in 1921 in Canada. Learn more about World Diabetes Day and how you can get involved. As a simple show of support, think of doing something “blue” this Saturday like lighting a blue candle in your home or workplace or wearing a WDD pin. The blue represents the sky and the circle unity across the globe in this effort. The icon also represents support for the United National Resolution on diabetes which was led by the International Diabetes Federation. As for me, I’ll be in Springfield, Pennsylvania addressing 75 fellow PWDs and nurses about healthy diabetes habits proudly wearing my pin. You can be sure I’m going to ask how many people know what it stands for. And everyone will by time I leave.